If you plan a major garage renovation project or the time for garage door replacement has come, you have great amount of work to do. In order to do an excellent job, you need proper preparation. One of the first things to determine is the size of the door or doors that you will need. Consider the main options available to you. The standard height of overhead doors is 7 feet. Such units are sufficiently high to facilitate the entry of any kind of car including a pickup truck. If you have a recreational vehicle that you want to keep inside your garage, you will need a taller unit. Depending on the size of the campervan, you can select from one of two height options. These are 8 feet and 9 feet. If you need even greater height, you may have to go for a custom door. Our experts in San Jacinto warn that property owners should not mistake the height of the door with the height of the entire system. The vertical garage door tracks stand above the unit itself and so do the springs. 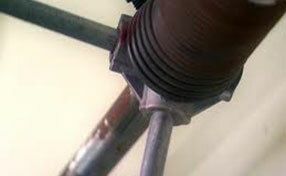 This means that there must be sufficient room between the unit and the ceiling for these components to be installed. If the garage has had no door before or if you plan to make any structural changes to it, you must measure the distance between the jamb and the ceiling to choose the right type of unit. The range of single-door width options is much greater. The traditional width option is 8 feet. However, since modern vehicles are getting ever bigger and wider and garages follow, manufacturers have begun to offer other options which are now considered standard as well. These include 9 feet and 10 feet. There are plenty of garage door parts to match the bigger units. If you plan to increase the size of your garage opening, you should definitely take these numbers into consideration. 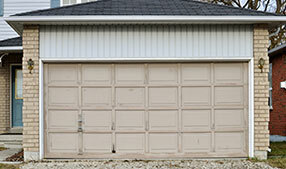 As many families now have two vehicles, there is a variety of double garage door sizes. While the height is typically 7 feet, the width options include 12, 14 and 16 feet. Again, it should not be hard to find matching hardware component and electric operators.